Located minutes from the airport, MOA and both downtowns, best of both worlds! 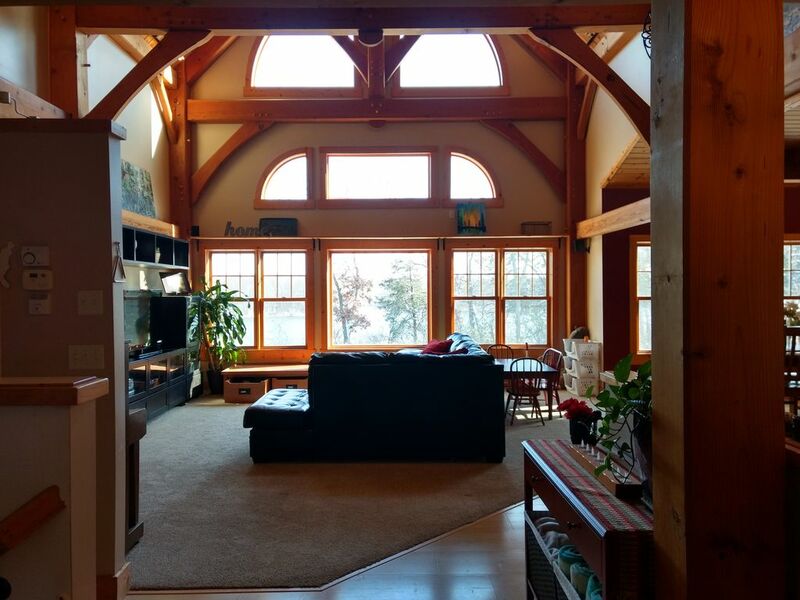 This River Retreat home is a waterfront property, in the scenic National Mississippi River Recreational Area. While it feels secluded, it is quite convenient to the MSP airport (20 minutes) and both downtown's. (St. Paul-25, Minneapolis-30). Enjoy the fall colors, the sights and sounds of the river right from the soaring great room windows, deck, patio and hot tub! Hawks, bald eagles, and birds of all kinds and barges on the river are common. Occasional visitors include foxes, coyotes, wild turkeys and dear. It is a fabulous space for family reunions, traveling sports teams, gatherings of friends and getaways. There is plenty of sleeping space and a loft area for the kids to hang out (photo coming soon) in addition to the living area. The kitchen, living room and dining room are all open to each other making it a great space to hang out with friends or family. There is an apartment above the garage that is not included with this rental. It has a private entrance in the garage where the only common wall with the home is. There are no shared spaces among the apartment and the home other than the garage. The apartment is where we crash occasionally when we are in town. (Previously, it was a corporate rental as mentioned in the reviews). We live in this house most of the time, but decided to do some extended travel this year for new career opportunities. We are making our home available during this time. Occasionally we will be staying in the apartment above the garage. Well, we built this home for our family a decade ago! We still love it, and have made several improvements lately, like new flooring and carpet on the main level, a bunch of new furniture, the hot tub & patio and a lot of cleaning up! We've put most of our personal effects away so this can feel like you're in your own home while you're here. Mississippi Riverfront property. The backyard overlooks the main channel of the Mississippi River. Kitchen includes Freezer/Fridge, Sink and Dishwasher, Gas stove, Microwave, coffee maker, and full dining and cookware plus some basic supplies like handsoap and dishsoap. Additional folding table and chairs available. Because we have several children of our own, the home is very child friendly and has all kinds of child accessories and toys for your own young ones. There are gates available for the stairs. The upstairs "Kids' bunk room" has 2 single over double bunk beds and a toddler bed. The upstairs bathroom has separate toilet/bath/sink areas for maximum efficiency. Like many riverside venues, we live near a railroad line, so the low rumble of the trains is a common daily occurrence. We had a wonderful stay here. It is a beautiful home with plenty of common space to gather with friends and family. The kitchen is well-appointed and open to the great room. The home was very clean and inviting. It is quite close to St. Paul yet tucked away on a quiet street with the Mississippi River right out back. We enjoyed watching the bald eagles and the gorgeous sunrises out the large picture windows. Nancy was very friendly and easy to communicate with. We could not have found a more perfect place for our family to meet and enjoy each other’s company. Aww, thank you Rachel! I'm so glad you had a great weekend with your family! It was a pleasure having you!!! The home was clean and spacious. Perfect for families with kids of various ages. There were several toys and video games. Right on the river with a lovely view. Thanks for your gracious review! So glad you enjoyed your weekend with your friends and family! Come back again anytime! We needed a place for 6 adults to stay and host family dinners and brunch for 13 for a family wedding weekend and this home couldn’t have been any better! Exceptionally clean, beautiful setting and everything we needed from the kitchen to the comfortable beds and more. We truly felt welcomed and enjoyed the wildlife the river and the trains. Close to the airport and easy to get to 494. We hit the jackpot! A perfect peaceful retreat, with plenty of space for anything you'd like to do... It was fun to see the wildlife, the river, and the changing sky above us. Nancy was constantly available to make sure everything went perfectly. This place is perfect for a quick get away for our group. It is close to the Twin Cities, but feels like a real hideaway. There are plenty of spacious rooms, bathrooms and areas to gather. It was a little strange to worry about the renter above the garage, but all in all, everything from the decks, patio with fire pit, hot tub, and lounge areas were perfect for our group of ladies! Glad you enjoyed your stay. Thanks for your review! FYI, we are no longer renting the garage, it is empty most of the time but when we are visiting for a few days here and there. Hope to see you again sometime! Nancy, her family and the awesome location were wonderful hosts for our eleven day stay during our daughter's wedding. Our guests from Finland and California all fell in love with this child friendly home on the Mississippi River; barges, boats, water planes and wildlife were the exciting daily experiences. Except for a few misunderstandings because it was such a new listing, a tenant over the guarge and availability of exercise equipment, this home was perfect for us, our two grandchildren, and our international guests. Thanks Elizabeth! We were glad to have you and your family! I'm sorry about the misunderstanding with the garage tenant. He is long gone now and we no longer rent it out, though we occasionally stay there for a few days when we are visiting home. Also, sorry about the exercise equipment..I think a setting must have gotten checked on accident. I will fix it! Thank you and blessings to you and your family! Inver Grove Heights is a suburb of St. Paul, Minnesota and has convenient access to Minneapolis St. Paul International Airport as well as many local attractions like the Mall of America (20 minutes), Science Museum of Minnesota, St. Paul River Center, Children's Museum and Como zoo (25 minutes to St. Paul), the Minnesota zoo (Apple Valley) , Eagan and Woodbury outlet shopping centers, and various other events and attractions. Seasonal events like strawberry picking (late June), the Minnesota state Fair (late August - Sept.) and the torchlight parade December) and St. Paul Winter Carnival (January) are must-sees for visitors and locals alike. The New Vikings Practice Arena -TCO Performance Center is about 10 minutes drive. Inver Grove has some great home town dinning options (B-52s, El Azteca, Jersey's, Mississippi Pub, Overboard Bar & Grill). Swing Bridge Park is a local historical park a short drive or bike from our home. The City of Inver Grove Heights can be contacted for information about renting one of their riverfront parks (both within approx. a mile distance) for your special event.